[ Originally published in December 2015 ] I began this post before Maggie Moris’ thought-provoking gratitude post. Thank you, Maggie, for reminding us about the deep work we writers do—every day. I too am grateful for the challenges my writing life presents and for other aspects about this life that I don’t always appreciate—my supportive friends and husband, agents and editors who tell it straight and send me back to the work, the students, alums and faculty of the Hamline writing community that feed me in so many ways. And I am thankful for one of the most incredible experiences of my writing life that took place out in the world, not at my desk. Please bear with my excited verbiage about my recent trip to Washington, D.C. for the National Council of Teachers of English conference. I am so very grateful. I flew out two days early to experience our nation’s capital again. Because I write about history, I wanted to visit the halls of power again where so many decisions have been made, to be reminded again about the evolution of our country. Thanks to Hamline alum Ellen Kazimer, a history geek like myself, we got around brilliantly. The second day we visited Mount Vernon where I came to appreciate our first president more deeply and to embrace the fact that he graces the cover of my new book My Country Tis of Thee, rather than Aretha Franklin. We also met an awesome fife player and guide whose interactions with third graders on our tour modeled ways to help young people enjoy history. But the first day rocked my soul. Ellen and I toured the Supreme Court and the capital. Across the hall from my senator—Maria Cantwell—is Al Franken’s office. 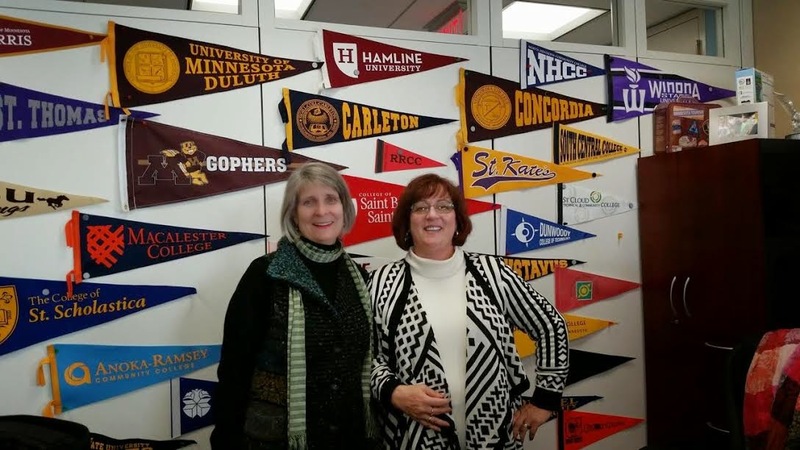 Ellen and I were delighted to take a photo in front of the Minnesota college pennants on his wall and tell the office staff all about the Hamline MFAC program. Then we heard testimony on immigration on a mostly empty Senate floor, some of it inflammatory behind belief. But I want to focus on the positive, on what came next. 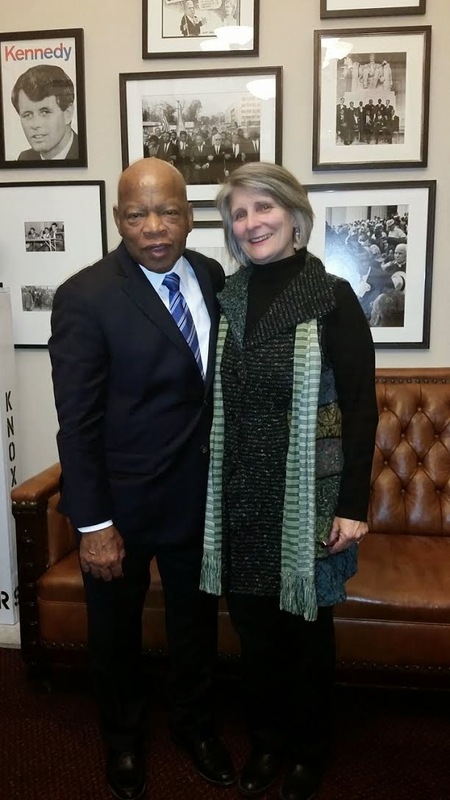 Ellen and I arrived at Congressman John Lewis’ office about fifteen minutes ahead of the interview time. I had met John at ALA last summer and he had agreed to discuss my new book project with me. Even so, I was delighted when his scheduler set me up with a face-to-face interview, only requesting the questions ahead of time. We had to wait awhile as the House was actually working that day, voting on some bill. Like a cat on a hot tin roof, I could barely sit still. Ellen admitted later that she was surprised how nervous I was. I was too. But John Lewis was my hero—Freedom Rider, speaker at the March on Washington, a member of Bobby Kennedy’s presidential campaign staff and, most importantly, the last civil rights activist serving in Congress. The 45 minute delay was a blessing. Ellen and I were allowed to stand in his office, which is like a museum to the Civil Rights movement and full of plaques honoring John’s service to our country. Bobby’s poster can be seen in the photo Ellen took of me and John. He’d been on the go all day, but when he arrived, he asked us if we needed something to drink. To drink! I know, I know. My students are thinking to themselves how much I abhor exclamation marks. But . . . that’s how it went down. He was gracious and thoughtful and considered every question. We had a great conversation about his time with Dr. King and the Kennedys. All my questions were answered, and I only glanced once at my list. In closing I asked him what I should write about today’s racism challenges, what I should say to young people. John Lewis should know. He’d been beaten senseless as a Freedom Rider in 1962, lost Dr. King and Bobby within two months of each other in 1968, seen Congress devolve to petty partisan politics. He didn’t cover up his pain during our interview. He’s just risen above it. He’s used that pain to keep going. My hero gave me sixty minutes of his precious time. Afterwards he left to receive another award – from the Washington Historical Society. But he talked to me like he had all the time in the world. NCTE was wonderful. I got to meet librarians, teachers and college professors who love kids’ books as much as do. I had coffee with the amazing Emily Jenkins and we chatted about our upcoming residency. I listened to Bryan Collier discuss how he painted the illustrations for My Country Tis of Thee, and learned that he stood on the Rotunda that cold, cold January day with his five year old daughter when President Obama was inaugurated and Aretha sang. John Lewis, you give me that hope. I can only pray for a smidgen of the courage you have shown us all. And writers out there, don’t ever hesitate to ask for an interview with one of your heroes. We need their stories, and you just might be the one to write it.